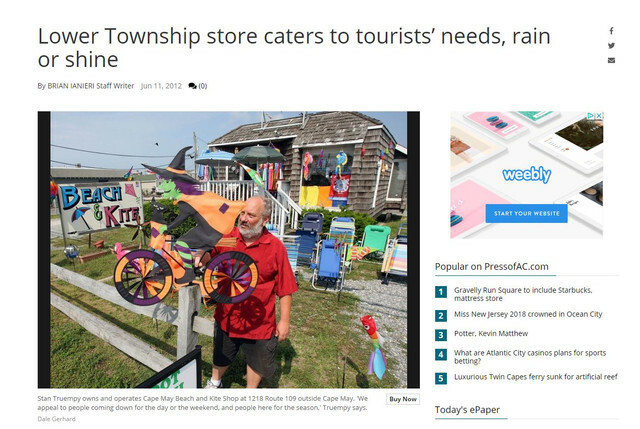 Cape May Beach and Kite Shop is a privately held company that provides a large selection of beach chairs and umbrellas in Cape May, NJ, and has been serving the community since 1998. We carry wind-proof umbrellas, lotions, toys, T-shirts, beach chairs, kites, wind socks, beach gear and much more - everything you need to have fun on the beach! Our high quality products are at prices everyone can afford. So when you're heading to the beach, stop by Cape May Beach and Kite Shop, for the best in beach umbrellas, beach chairs and beach gear in Cape May, NJ! Take a look what our local news says about us in the article below!